Not all games have an easy-to-use server browser or a join by IP feature ingame. This can make it difficult to immediately find your server ingame. Thankfully Steam provides a feature with it's desktop client to allow you to monitor and join your server. First make sure your server is Online. If it is marked as Offline or Started it will not be discover-able. Some servers take a minute or two to fully start up and show as Online. Click on the Favorites tab. Enter the Hostname or IP address of your server with the port as well. 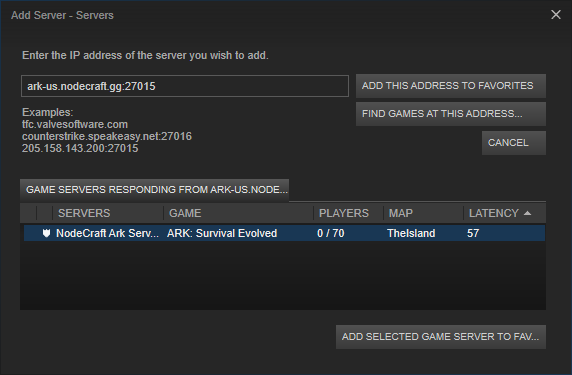 For example an ARK server might read ark-us.nodecraft.gg:27015. Check the Overview Tab in NodePanel if you are unsure what your details are. NOTE: You may need to use the query port to find your server in this list. For PixARK/Dark and Light, this is 27016 by default in our platform. Now you can click on the server when it's listed in the tab, and join it immediately.